Ensure that both the buoy and pot are named. As well as paint or vivid marker, which fades quite quickly, your buoys and pot can be permanently named by melting the plastic with a soldering iron. Store out of direct sunlight to preserve plastic components. If unfamilar with the area, try setting multiple pots perpendicular to the shore. Then if one pot catches crayfish but the others do not, shift them so that the rest are in a line parallel to the shore with the successful pot. Try to set the pots on a rocky bottom. Ensure that you have sufficent rope - allow for the tide and provide additional rope to allow the current. Use sufficiently large buoys to prevent the current from dragging them underwater. Ideally use two buoys with approximately three metres of rope separating them. Ideally one of the buoys should be at least 250mm in diameter. 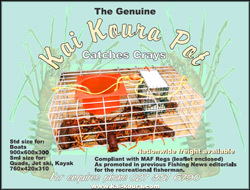 To dispatch (euthanise) your crayfish humanely, put it in the freezer for at least 30 minutes. This is the method recommended by the New Zealand Rock Lobster Industry Council. For best results, cook the dispatched crayfish in boiling seawater. If seawater is not available add a desertspoon of salt to the boiling water. After the crayfish is cooked (between 6-12 minutes depending on size) drop it straight into a sink full of cold water for 30 seconds to prevent it from continuing to cook. Remove and let drain and cool. Many people prefer crayfish cold or lukewarm rather than hot!